There’s no shortage of Disney-licensed games on the shelves, and the vast majority of them you wouldn’t give a second look. 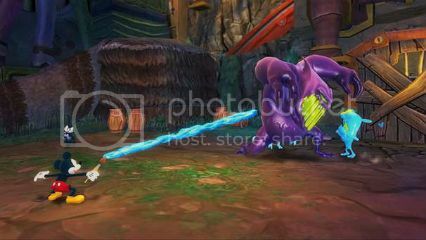 Epic Mickey 2: The Power of Two however is not only a “proper” game, it’s also graced with the involvement of industry legend Warren Spector. What manner of beast has this collaboration resulted in? The original was a Wii exclusive, meaning many who play this multiformat sequel will find themselves asking questions that are never adequately answered. Questions like “Why is Goofy a cyborg?” “What is ‘the Wasteland’?” “A magic paintbrush – say what?”, and “Who’s this rabbit following Mickey Mouse around everywhere?”. The answer to the final question is “Oswald”. More of a bitter, twisted and slightly sinister figure in the first game, he is now a completely rehabilitated chap happy to fight with Mickey rather than against him. 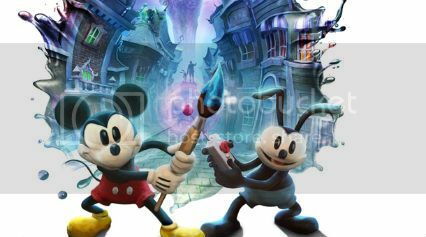 Generally speaking in fact Epic Mickey 2, while retaining a darker tone than most of Disney’s output, is thematically much less complex and brooding than the first game. There are a few grumbles now and again amongst the populace of the land of forgotten toons but, as a rule, resentment and jealousy are pushed so far into the background here that they’re virtually invisible. The green stuff is Thinner, just as deadly to you as it is to your enemies. Visually, the Wasteland is a wonder. Not in a ‘500 fps, anti-aliasing texture zzzz’ way, but in a ‘now this is real art design’ way. The Mickey Mouse on display here is the one from the days before almost anybody reading this was born, an aesthetic that carries over to almost everything else in the game. This bold decision alone is enough to make an impression, but the talent and love that went into sharpening the design is undeniable. Stranger still then that there are so few attempts at humour in the script, and those which turn up invariably fall flat. Most impressive of all are the brief 2D side scrolling sections that link the different areas of the 3D platforming overworld. Here you are literally inside a classic cartoon. You might be traversing a black & white cartoon building site; making your way through an area of anthropomorphised instruments; or perhaps avoiding beaming, dancing skeletons as you run through a cemetery. Even those indifferent to Disney will find it extremely difficult to avoid being impressed. In the 2D sections, you’ll run and jump and do little else until you reach the exit. The real meat of the game lies in the aforementioned 3D gameplay. Vital to success in combat, exploration and puzzle-solving alike is Mickey’s paintbrush. Acting as a sort of hose, it shoots paint (for befriending enemies, or filling in certain pieces of the environment) and thinner (for wiping enemies, and certain pieces of the environment, from existence). Oswald on the other hand has a TV remote (don’t ask) which plays a vital part in certain puzzles, as well as shooting electricity to stun enemies. Oswald can be played by either a human or AI; a human player will find themselves essentially providing support for player one, while AI does the job for puzzles but can be frustratingly slow to help in a fight. Befriended enemies will even fight for you, sometimes providing much-needed distraction. The paint/thinner mechanic is often used to offer players the choice of a ‘good’ or ‘bad’ solution to a puzzle. As this usually boils down to a choice of ‘make stuff or break stuff’ though it’s never used in any meaningful way, and consequences for your actions rarely extend beyond a sentence or two from an NPC. That said, you’ll sometimes find yourself in an area that reacts to your actions. Go out of your way to repair your surroundings and befriend enemies rather than fell them, and you’ll notice a river of water or even paint running along the ground. Revel in mischievous destruction however and it will be life-sapping thinner that flows. In terms of controls, it’s worth noting that using Move or (presumably) a Wiimote is best for keeping a stream of paint/thinner concentrated during combat, while the dual stick method – the only option for Wii U, though a second player uses remote & nunchuk – makes keeping the camera under control easier. On another Wii U note the frame rate struggles to stay stable, and the gamepad screen is relegated to minimap duties; but those are the only differences worth reporting. The overwhelming charm offered by the gorgeous presentation and stream of Disney cameos is enough to pull you through most of the story – but that charm wears thin in the final hours, when the game reluctantly admits it should make things trickier. The harder fights frustrate (particularly if playing with AI) due to imperfect controls, not to mention the fact that the ‘amusing’ animation when you get hit leaves you wide open to further attacks before you can escape. Add to that platforming sections just demanding enough to confuse the camera, and the end of the game limps rather than bounds to the finish line. Disney connoisseurs are likely to forgive pretty much everything, and will be delighted to see that there are even a half dozen or so songs from the is-he-reformed-now-or-not Mad Doctor (though only two of them are any good). Of more wide-ranging appeal are the generous array of side missions which you’re welcome to finish mopping up after the end credits. Many are little more than fetch quests, but if you’re still playing by then you won’t really care. That’s this game in a nutshell really; it’s a captivating world masking so-so gameplay. 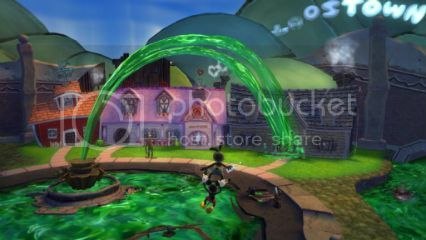 The more seeing all of this world is important to you – no matter what you need to do to see it – the more you’ll get out of Epic Mickey 2.